On the Herts/Essex border, Paradise is far more than just a zoo and offers a fun-packed (and fact-packed!) day out for children of all ages. Lucy Dimbylow visited Paradise Wildlife Park with her children Katie, seven, and Tom, 12. A visit to the zoo is always a treat, but Paradise Wildlife Park has far more on offer than just animals (although it does have over 500 of them, too). The site is roughly split into two halves, with the animal park on one side, and a huge range of outdoor and indoor play spaces on the other. 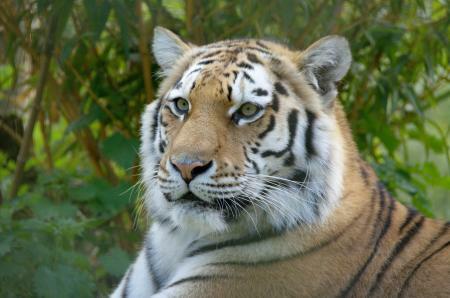 The zoo specialises in big cats (and has a sister Big Cat Sanctuary in Kent), with rare breeds including snow leopards, white tigers and white lions on show, alongside cheetahs, tigers, ocelots and more. You’ll also get to visit gibbons, meerkats, otters, reptiles, zebra, wallabies and many other species. Once you’ve seen the animals, you can take advantage of Paradise’s other attractions, including five adventure play areas to suit all ages, indoor soft play, mini golf, a miniature railway and the all-new World of Dinosaurs. The Farmyard is the place for the youngest members of the family to get hands-on with friendly animals like goats, sheep, rabbits and guinea pigs (and it’s undercover: a blessing on rainy days). We also liked the way many of the enclosures had posters on display showing the Makaton sign for their animal inhabitants: great for pre-verbal children and those with communication difficulties. 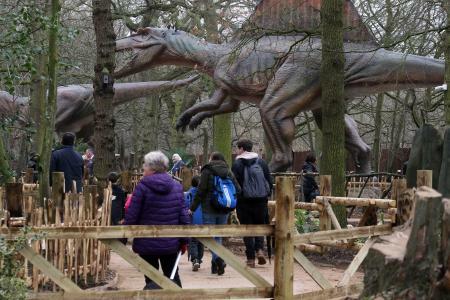 Dinosaur-mad kids will love the new World of Dinosaurs: a woodland trail inhabited by 30 lifesize – and very lifelike – animatronic dinosaurs. Each beast has a display board giving facts about the species, so your child can brush up on their dino know-how. Don’t miss the Dino Dig, next to the gift shop and café, where your mini palaeontologist can excavate ‘bones’ in the sandpit. The animal park itself is a treasure trove of facts about endangered species and conservation, with detailed information boards at each enclosure. The Reptile Temple is particularly appealing to kids who love everything creepy crawly, while the Amazon exhibit is a must-see, featuring one of the world’s biggest snakes. It’s well worth timing your day around the various animal talks: these are delivered by knowledgeable animal keepers, and will provide your child with lots of brilliant bits of trivia about the park’s inhabitants. 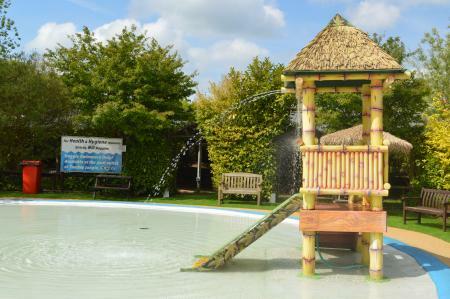 Paradise Lagoon, an outdoor paddling pool that’s open from the end of April each year. It’s a welcome opportunity to cool down on a hot day, so make sure you take your swimming costumes. It’s also worth visiting Wolves in the Wood: this exhibit is on the other side of the park to the main animal area, but is a great opportunity to see wolves in a near-natural environment. The park puts on regular themed events, such as their popular Otter, Tapir and Big Cat Weekends, Howl-o-ween and Santa’s Grotto, plus special offers throughout the year, including free entry for mums on Mother’s Day (and dads on Father’s Day). There are four restaurants/cafes in the park, including the indoor, seated Safari Sam’s Diner and Smoking Sam’s BBQ. There are also a number of refreshment stands selling drinks, snacks and ice creams, and a multitude of places to have a picnic. Paradise Wildlife Park, White Stubbs Lane, Broxbourne, Herts, EN10 7QA. Tel 01992 470490. Opening hours 9.30am till 6pm (5pm in winter). General admission £21 per adult (16+), £18.50 per child (2-15 years), under-twos free. There is a discount available when you buy online, and there is also a range of family tickets and season tickets on offer. Free parking is available onsite (although note that the overflow car park is the other side of the main road). There is also a minibus transfer from Broxbourne station, costing £3 per person (under-twos free). There’s plenty for your child to spend their pocket money on in the gift shop, ranging from animal masks and stationery to t-shirts and a vast array of many species of cuddly toys. There’s also a Dino Store selling dino-themed goodies like excavation kits and giant dinosaur paws, and the Conservation Cabin which sells souvenirs like notepads, postcards, cuddly toys and ornaments, starting from 50p. Proceeds go directly to conservation projects worldwide. You can subscribe online to Zoo News for regular updates by email, and find out about the rather bleak history of the park, which first opened in the early 1960s. There’s lots of information about the park's different animals online and you can find out about its conservation projects, too. Identifying and classifying a range of animals including fish, amphibians, reptiles, birds and mammals. Identifying and naming carnivores, herbivores and omnivores. Describing and naming the structure of a variety of common animals. Identifying different habitats and understanding how they provide for their inhabitants. Describing how animals get food through food chains. Finding out about the basic needs of animals for survival. Understanding the function of the skeleton and muscles. Understanding environmental change and how it can affect living things. Naming and locating continents and oceans.